Hard water makes it hard for soap to lather, turning cleaning and showering into nuisance chores. It leaves buildup on the inside of your pipes, which can lead to clogs and subsequent drop in water pressure. It stains your laundry and leads to the quicker breakdown of your clothing and other washables. This is probably the biggest thing you should be concerned with in regards to hard water—what it does to your water-using appliances such as your dishwasher, washing machine, and your water heater. The water heater of your home is the most vulnerable to this problem, and you could quickly find yourself in need of Salt Lake City water heater repair, if not replacement, if you don’t have your hard water problem properly addressed. 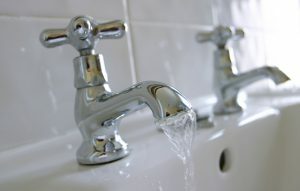 We already mentioned how hard water contains minerals that aren’t harmful to you but can be harmful to your plumbing. This is because when they’re in your water in high concentration, they leave behind limescale—and the trouble begins. The temperature inside your water heater tank enables limescale to form, and then this settles along the tank floor. The sediment layer eventually builds up enough that it lowers the energy efficiency of the water heater. This is especially true in gas powered systems, since this is where heat from the gas burners is transferred into the tank. The sediment essentially insulates the heat exchangers, forcing the water heater to run longer trying to do its job, draining more power than it should. Having your water heater tank flushed on a regular basis will help with this, but this is a temporary fix to a permanent problem. The buildup will begin again unless the hard water problem is stopped at the source. Well, no, that’s not quite right. Even if you have a tankless system, it’s not immune to the harmful effects of hard water. Limescale can and does still build up against the heat exchanger, which slows down the movement of heat, and the efficiency suffers just like it does in a traditional tank system. Worse, the mineral deposits can actually close off the narrow flow passages through the tankless system, causing water pressure in the house to plummet. Water softeners function by swapping out hard water minerals. When our professional plumbers install a whole-house water softener onto the water main coming into your plumbing system, your hard water problems will be eliminated. Not only does this mean your water heater can gain back its energy efficiency, but you’ll be looking at healthier pipes overall—pipes that are less likely to need premature repair or replacement when they don’t have hard water minerals eating away at them.